Aluminum Convertible Hand Truck Dollies are versatile wonders that can work in both the vertical and horizontal positions. The task of transporting smaller crates or long narrow boxes is now simplified. 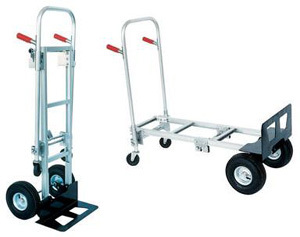 These carts roll smoothly on 10" x 3½" rigid pneumatic and 4" x 1" swivel solid rubber casters. Ships knockdown. Hand Truck Specs: overall size 20"W x 20"D x 54"H ; nose plate 17 3/4"W x 7 3/4"D; capacity 500lbs.Platform Truck Specs: overall size 20"W x 49"D x 41"H ; capacity 650lbs. Fork Extensions - Fork Width 6"